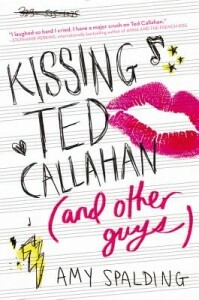 kt literary » Blog Archive » Happy Book Birthday to KISSING TED CALLAHAN! Happy Book Birthday to KISSING TED CALLAHAN! It’s finally here! At long last, you can meet Riley and Reid and the aforementioned Ted Callahan in a book that Stephanie Perkins praised, saying “I laughed so hard I cried. I have a major crush on Ted Callahan.” You can check out an awesome interview with Amy Spalding on the B&N Teen Blog, or see Amy’s playlist for the book on I Heart Daily. And if you’re lucky enough to be in L.A. this Saturday, you can go to Amy’s release party for TED at Skylight Books! Get your copy today and send Amy all the congrats on Twitter @theames! ← Happy Book Birthday to EMISSARY!